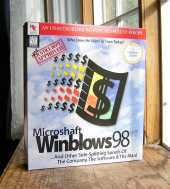 The company that has produced hilarious CD-ROM parodies of the popular TV program The X-Files (The X-Fools) and the successful computer game Myst (Pyst) have turned their high-tech humor on software giant Microsoft Corp. Microshaft Winblows 98 is a spoof of the company, its software, and its hypercompetitive founder William H. Gates III. Stamped on the box: ''Not Justice Dept. Approved Because We Never Asked.'' Load the game, and the main Windows screen appears with icons for the out-of-control panel and the reject bin, where you can look at a collection of products that didn't make it out of Microshaft's labs. There are plenty of games, including a computer trivia game show called Win Bill's Money, and The Roll Ahead, an interactive board game in which players can see whether they have what it takes to be as successful as Chairman Gates. There's even a virtual toy: the Billagotchi. Here's your chance to own your very own virtual chief executive. But make sure you feed him lots of money and tend to his needs. Otherwise he throws a tantrum. Oh, yes - Janet Reno and Ralph Nader, according to the games developers, give the product two thumbs up.